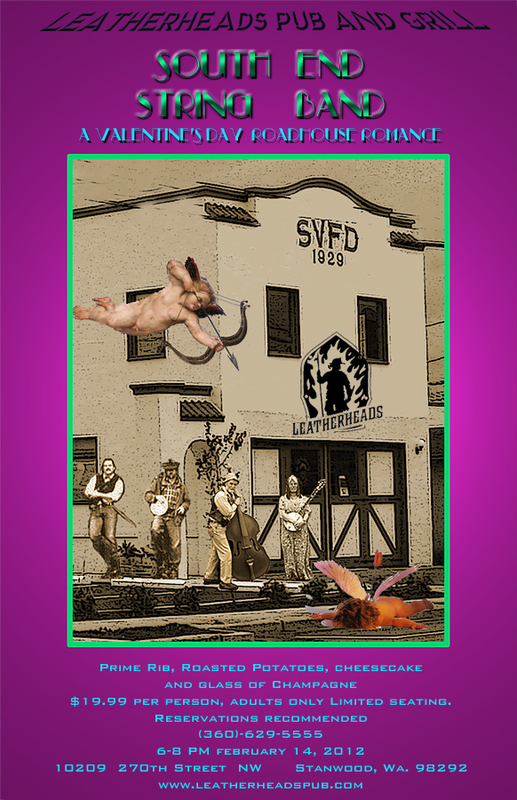 Leatherheads Pub and Eatery is celebrating St. Stanwood’s driving of the snakes out of the downtown area back in 1852. The Irish got nothing on us! Corned beef and cabbage, green beer, leprechaun tosses and a full day of music by 5 local bands who’ve kissed more than a Blarney Stone or two, all for no cover charge. Music starts at noon and goes until the last elf has sung Danny Boy. On the gnarly shores of the South End, romance isn’t your saccharine cornball AM bubble gum love song. It’s not some sappy Hallmark card claptrap. You think you can grab some half wilted daffodils off the IGA floral stand and give that to your sweetie with a box of cheap chocolates and think he’s gonna forget those other 364 days of neglect, you deserve that crummy marriage. Woman, up, Sister! Down by us we promised our boyfriends and husbands Love with an Edge, Romance with Teeth. Maybe it’s not a bed of daffodils, but it’s got more than its share of thrills. You want to see what we mean, grab your man and head on up to the Leatherheads Pub and Eatery on Valentine’s for a Night on the Wilder Side. Prime rib, champagne and the footstomping strains of their own roadhouse romantics: the South End Death Cab for Cupids. 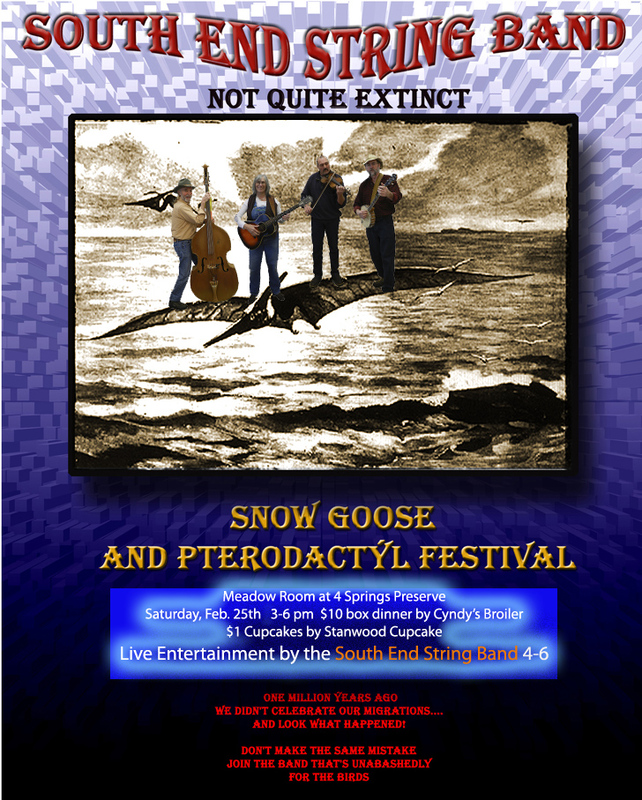 Okay, really, the South End String Band. the new band’s in town…. Down in the nettle hollows of Camano’s South End, the Stringslingers keep a shaky armistice between the ranchers of the gated communities and the pioneers who hate barbed wire. They know sometimes it takes more than just damn fool talk. Sometimes it takes persuasion. 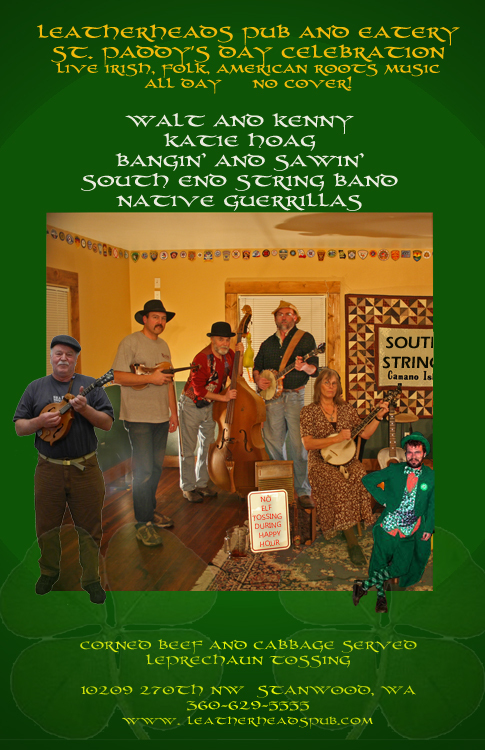 If necessary the Stringslingers enforce that tense peace with a hail of banjo bullets and a fusillade of fiddle riffs. These five mean business. If you’re expecting Home on the Range, you best reconsider. 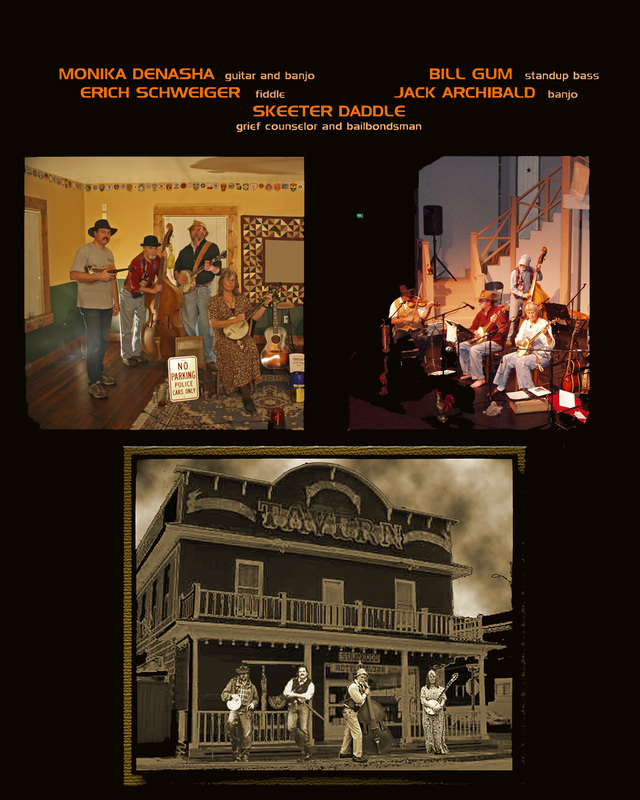 This is roots music to take the bark off your quiet reverie. You’ll be checking your weapon at the door, count on that. You’ll thank us later…..